Thought provoking read. It seems clear that a lack of appropriate expertise on the water crisis situation at hand in the FWC caused the FACHEP team to go off in all directions looking for the next crisis to warn public about. An unfortunate situation for both the public and taxpayers. Excluding appropriately trained microbiologists makes little sense yet it seems clear the FACHEP group apparently did just that. Decades of experience in water systems would help one understand true risks (or lack thereof) associated with their POU filter ‘findings’. A good example of how “perverse incentives” of academia can blossom and take over in a post-crisis environment with extraordinary funding availablity for this group. Can you imagine what would have occurred had McElmurry received $13M rather than the ~$3.8M previously reported? Perhaps it’s good more damage didn’t occur? Thank you for sharing some details on this truly unfortunate situation for Michigan taxpayers. And yes, your Sloane MOBE Keynote lecture is excellent; have shown it in my own classroom, definitely recommended viewing on this topic. Proving that you cannot make this $hit up, Wayne State eventually did get about $13 million total, based at least partly on McElmurry’s “divine conception” story. As academic and ethical soulmates, Dr. Love and McElmurry continue working together. Read this description of the $1.6 million dollar grant awarded September 2018. 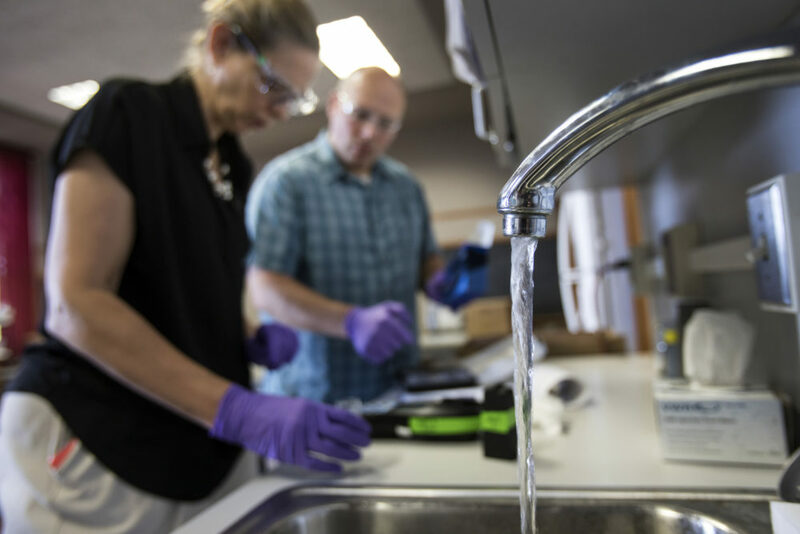 “The project — which includes examining drinking water and public health systems — will provide new insights as to how these systems interact, with a focus on crisis events. …..and how the public engages with these systems. Without knowing all details, perhaps Eden Wells (or Lyon) crime was not properly vetting, and hiring this team in the first place? Despite McElmurry’s apparent slick con-job in fabricating his qualifications, it seems it’s buyer beware in giving out research contracts these days. Maybe there needs to be some type of NFP clearinghouse listing deep and authentic scientific expertise run by neutral bodies such as National Academy of Science, ASM (microbiology) or other…. brainstorming on methods that might reduce cases of charlatanism which I fear may be becoming more common in today’s cut-throat sales pitches required to get federal funding. Folks are reading; one colleague just gave me copies of “The Cheating Culture” and “Blind Spot” (something you and Siddhartha do NOT have) in honor of your exposé. We are getting hundreds of hits in Michigan alone. Obviously Detroit and Ann Arbor are lighting up along with East Lansing. As explained in part II, all the evidence suggests McElmurry’s hiring was a Wayne State alumni job, without ANY normal vetting. Everything I have seen suggests it all started with Dr. Reynold’s input, as presented in his testimony under oath, then confirmed by Mr. Hollins and Dr. McElmurry and in the Nick Lyon emails. 1. The funding agencies should rightfully request for a partial or full return of funds obtained using false representations of qualifications and previous research. This has been clearly identified in McElmurry’s e-mails as well as the cover letter sent by Drs. Carol Miller and Shawn McElmurry both of Wayne State University to NIH and perhaps other funding agencies claiming their in-house computer model of the Flint water system and past expertise. Both State and federal funding agencies need to take action on this. Failure to do so is negligence on their part and damaging to the finances of state and federal taxpayers. 2. Dr. Faust (and her advisor) should properly, and ethically, file separate complaints against McElmurry’s (and perhaps Miller’s) PE licenses to LARA. Coercing a full computer model out of a student whom one served as external member of their dissertation committee at another institution, then presenting it as one’s own, while informing the student (who is just starting out and seeking funding) that she isn’t going to be involved in Flint because the research has ‘taken a different direction’ is one of the lowest academic acts against a PhD student imaginable. Advising her to reach out to others to work with and seek funding in response to her plaintive requests to get involved in the ‘research’ activities in Flint was likely necessary to ensure she didn’t observe ongoing use of her computer model and uncover the ruse. Lack of action on this misconduct may well lead to more dissertation committee members (such as McElmurry) to wrongfully assume that the Intellectual Property developed by a student is free and belongs to all committee members. It is a dangerous precedent. 3. Not much can be done regarding Nancy Love’s e-mails demonstrating disorganization and a stated lack of time to deal with personal ethics issues and obligations, while still finding time to offer subjective critical assessments of her former colleagues “impartiality” and “conflict of interest”, the later of which seems nonsensical. However, they speak volumes about her character and constitute a near perfect example of back-stabbing a colleague. 4. Edwards didn’t seem to have any choice but to disclose these acts of misconduct and ethical breeches for the same reason that Faust needs to take action on item 2 above. Undoubtedly there is more that needs to be done. Without consequences these sorts of deeds of misconduct will certainly proliferate and lead us more into the era of Post-Truth science of which Edwards warns. I agree it is one of the lowest academic acts ever. Yet, it is a lot to ask of a young assistant professor faculty member, if betrayed by a member of her graduate committee, to file an ethics complaint. And I was not disappointed. Stay tuned, the craziest material is still coming. Also, be aware that if you EMAIL MATERIAL TO ANYONE, no matter how you were induced, NIH claims that is a COLLABORATION. That is right. You emailed it, end of story. Also, NIH claims the pre-proposal is NOT PART OF THE PROPOSAL. So you could apparently lie in your pre-proposal letter, and that does not count. NIH can also not tell you if they are investigating or not. You get an idea how frustrating this can get.